A cousin of mine is turning 18 and is throwing a massive party with family and friends. The kind of party where you wear a cocktail dress and sip Champagne all night long. You may not know my resolution for this year was not to buy any clothing (except for a pair of jeans) in 2012 so I am going to re use an old dress of mine. But nothing prevents me from making my own trendy accessories, huh? 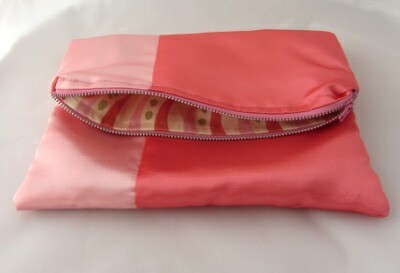 So I made a fold over clutch in coral and pink colour blocks. More Summer 2012 than that? It would probably be painful. Which is good because my dress is a bit 2008. This week I show you how to make this must-have accessory. 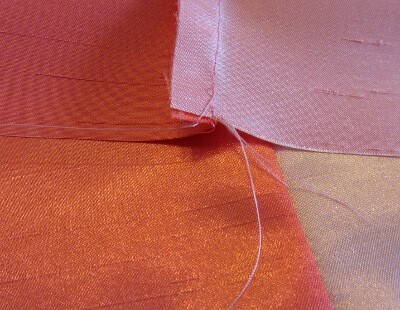 I picked some polyester fabric that looks like silk. The lining incorporates contrasting colours (this is from the gorgeous Pear Tree collection by Thomas Knauer). 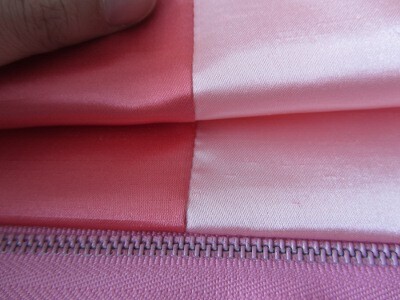 The zipper is pink but it would also look nice in one of the lining contrasting colours. You’ll notice the colour blocks are side by side rather that on top of one another. 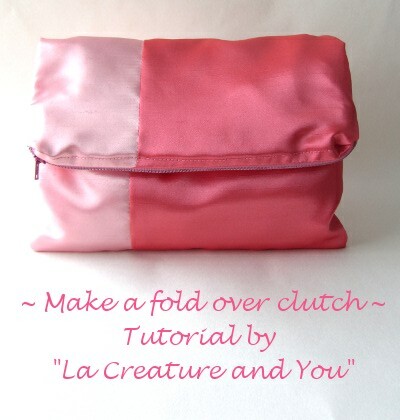 This way you can fold the clutch wherever suits you without loosing the benefit of colour blocking. 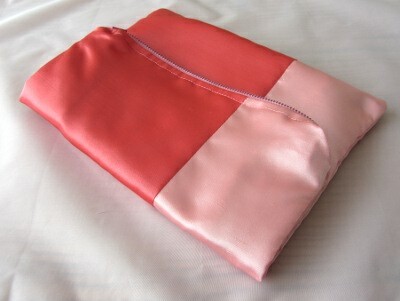 The clutch is 25×30 cm (10×12 ”) when laid flat. It can fit lots of stuff, even my e-reader. You fold it where ever suits you or not at all. This is a very versatile handbag. This is a medium difficulty project. It include making the outer pieces and fitting a zipper. I can be completed in two to three hours. I spent around €6 (approx. GB£5 / US$7.5) for the supplies because the outer fabric was a bit fancy. 1 – Lay each small block on top of one large block with right sides facing one another. Pin the edge where both pieces overlay as shown on picture 1. 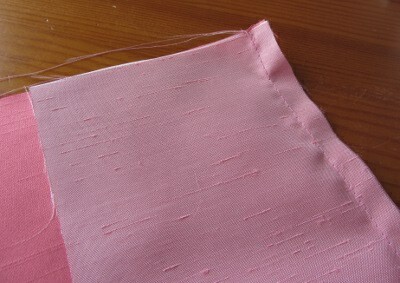 2 – Stitch along the pined line using a 1 cm (0.4 ”) seam allowance (see picture 2). 3 – Press the seam flat making sure it is not showing through if you use a light colour fabric (you would then need to fold the whole seam towards the darker fabric side as shown on picture 3). You now have two outer pieces. 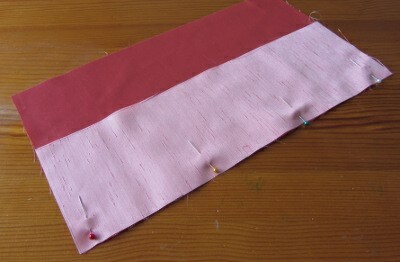 4 – Lay one lining piece right side up. Lay the zipper right side upon top og this making sure it is centred (picture 4.1). Lay one outer piece wrong side up on top of the zipper. Make sure the three items top edges are flushed and pin together (picture 4.2). 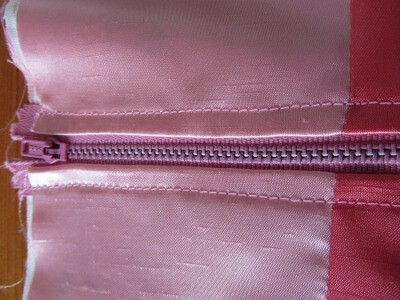 5 – Fit your zipper foot and stitch close to the zipper teeth (picture 5). 6 – Lay the second lining piece right side up. 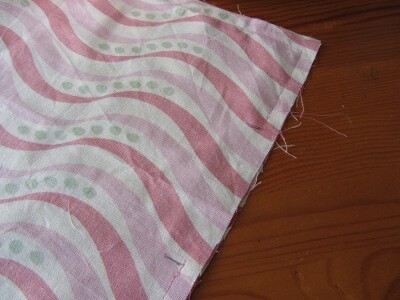 Lay the zipper right side up on top of this so the free side is flushed with the lining top edge. Lay the second outer piece with its wrong side up on top of the zipper, top edges flushed.here you have to make sure outer pieces seams are aligned (picture 6.1). 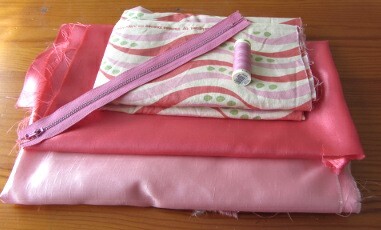 You end up with a pile of fabric with from top to bottom: outside piece wrong side up, outside piece right side up, zipper right side up, lining wrong side up, lining right side up (picture 6.2). 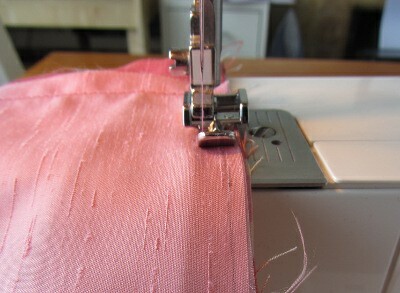 7 – Still using the zipper foot of your machine, stitch as close to the zipper teeth. 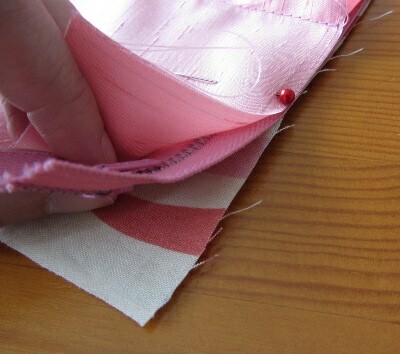 8 – Press the seam flat (careful if you use a plastic zipper as it may melt) and pin each outer with its lining piece a good 2 cm (0.8 ”) away form the zipper, making sure the seams are very flat. 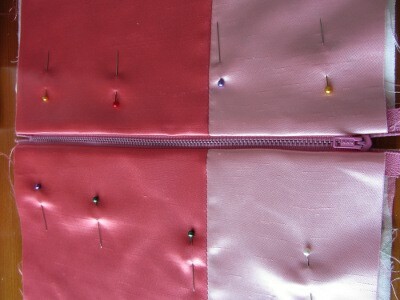 9 – Keep the zipper foot one and top stitch the zipper about 0.5 cm (0.2”) away from the seam (picture 9). 10 – Half open the zipper. Move the pieces around so the two lining one have their right side facing one another and so are outer pieces. Pin lining pieces together and outer pieces together. 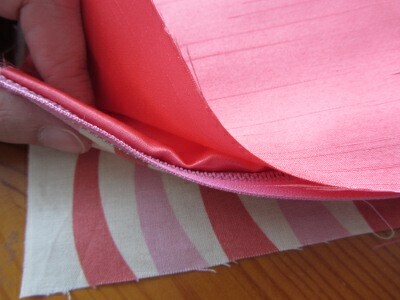 11 – Stitch around using a 1 cm (0.4 ”) seam allowance and leaving a 10 cm (4 ”) opening in the lining (picture 10.1). 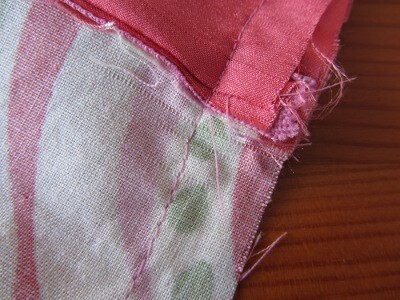 Mind your needle when stitch over the bulk of the zipper (picture 10.2). 12- Clip corners. Turn the clutch around through the lining opening and the open zipper. Make sure the corners are well formed, you can get them right using a chopstick or a pen. 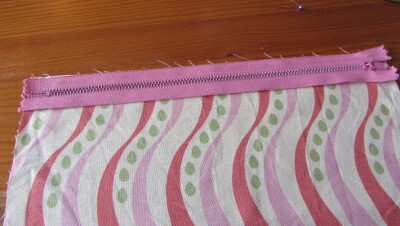 13 – Close the opening in the lining with a ladder stitch. You’re done! What colour will you pick for your clutch? Please send me a picture as I would love to see what you make!